On the Cover: Cover story	10 Home Show offered Kansas Citians everything they need to create happy, healthy and hip spaces wherever they live. KC MADE showcases the talents of local high school students through a variety of carpentry, woodworking and mixed wood/metalwork projects. HBA members gathered for a membership event on Friday, March 22 during the Home & Lifestyle Show. â&#x20AC;&#x153;I am thrilled to join an industry so committed to making the Kansas City area such a special place to live and grow,â&#x20AC;? said Ruder. Learn useful information and ways to prevent theft on the jobsite. KCMO Candidates: The candidates in attendance included (left to right) Steve Miller, Scott Taylor, Quinton Lucas, Scott Wagner, Phil Glynn, Alissia Canady and Jolie Justus. HBA Co-Hosts KCMO Mayoral Panel Kansas City mayoral candidates met in Westport on Feb. 28 for a forum on real estate. This event was sponsored by several area organizations, including the HBA. Mark Alford of Fox 4 News moderated the evening. The crowded mayoral primary on April 2 determined Jolie Justus and Quinton Lucas will be the two candidates on the ballot June 25. Lucas and Justus are both serving their first term on the city council, representing the Third District and Fourth District, respectively. Justus has previous experience serving as a Missouri state senator for eight years. Lucas, like Justus, is an attorney and currently teaches at the University of Kansas School of Law. Cocktails & Appetizers 6:00-7:30 Presentations 7:30 Coffee & Dessert to follow Members: $70 â&#x20AC;˘ Non-Members: $85 Reservations are due by April 22 Register online at kchba.org or contact Kelcee@kchba.org The Spring Parade is supporting Harvesters. Please consider bringing a monetary or non-perishable food donation to the event. Little Agency gency Aoars! Little R Roars! Fasone &partners Fasone inc. &partners Advertising MArketing Pr inc.
2019 HBA Golf Tournament Registration Open With warmer weather finally here, itâ&#x20AC;&#x2122;s time to start thinking about the annual HBA Golf Tournament! Meet us at Stone Canyon Golf Club on June 13. This event sells out every year. We already have a few teams and sponsors signed up. Donâ&#x20AC;&#x2122;t miss your chance to participate! We have a cap on the number of four-person teams in the tournament. Available sponsorship opportunities include: Presenting Sponsor, Breakfast Sponsor, Lunch Sponsor and Golf Hole Sponsors. Email Paige@kchba.org to reserve your spot or sponsorship today. Highlights of Home Show: Celebrity Announcement, Smart Home and a $25,000 Donation The Greater Kansas City Home and Lifestyle Show presented by the Home Builders Association of Greater Kansas City (HBA) on March 22-24 offered Kansas Citians everything they need to create happy, healthy and hip spaces wherever they live. “Our theme this year was #HowYouHome, and we wanted to offer design and home improvement tips to people in whatever place they call home. That may be an apartment, townhome, loft or house,” said 2019 KC Home Show Chair Matt Ernst of Ernst Brothers Construction. 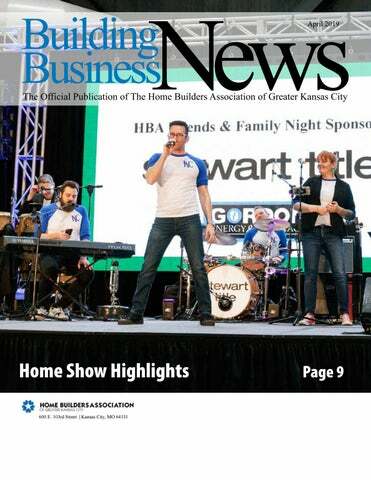 “Decorating styles, technological innovations that you saw displayed in our Smart Home, and home design trends are always changing, but home—and a sense of home—remains our anchor.” For 71 years, the Home Builders Association’s Home & Lifestyle Show has offered Kansas City the most current and wide-ranging displays of home improvement, and 2019 was no exception. Presented by Makita, the show featured guest appearances from entrepreneur and TV personality Bethenny Frankel, as well as Tamara Day, star of DIY Network’s Bargain Mansions. On the Main Stage, Day announced some breaking news — her Bargain Mansions show is moving to HGTV as of April 15. An interactive smart home courtesy of Patriot Homes took center stage at this year’s show. The home featured the latest in technological innovations, including a Samsung smart refrigerator with touchscreen door, voice-activated Kohler smart mirror and Moen shower head and an automated lawn mower by Gobomow. The Smart Home was outfitted by Ferguson/Factory Direct and demonstrated just how simple life can be with a few gadgets and a reliable Wi-Fi network! attendees to walk through. To support VCP, HBA members and Bonner Springs High School built playhouses that were auctioned off to the highest bidder during the show. Additionally, $1 of every ticket sold online benefited VCP. In total, the HBA donated $25,000 to VCP. The 2019 show featured a Backyard Oasis sponsored by Stonebridge Outdoor, Price Chopper Cooking Stage featuring Instagram’s #detoxinista and other local restaurant chefs, an interactive play area sponsored by Backyard Specialists, Pub in the Park with TVs airing March Madness action, and dozens of vendors. MO North Area Council Features New Leader, Build-PAC “I can think of no better organization to work for than one that literally puts roofs over people’s heads,” said new Executive Vice President Will Ruder to attendees at the Missouri North Area Council on March 27. Ruder introduced himself to the group and provided insight into his background and his goals for leading the organization into the future. “I plan to create, develop and expand existing and non-existing relationships to position the organization exactly where it needs to be,” said Ruder. Ruder noted that there is no better place to live and raise a family than Kansas City and he looks forward to meeting every member of the association in the coming months. Also speaking at the area council was Gary Kerns of Gary Kerns Homebuilders. He and Ruder explained how NAHB’s BUILD-PAC works and why it is important to support it. BUILD-PAC helps elect pro-housing, pro-business candidates to the U.S. House of Representatives and U.S. Senate, explained Kerns. “NAHB members will save about $5,500 per housing start in 2019 due to NAHB’s advocacy efforts in 2018 and other member benefits.” “Investing in BUILD-PAC is one of the best ways to be engaged and shape political outcomes,” Kerns continued. “In the 20172018 cycle, BUILD-PAC raised more than $3.1 million to support candidates in the election. BUILD-PAC disbursed more than $2.9 million and supported 370 candidates – 85 percent of whom won on Nov. 6.” BUILD-PAC scores every Member of Congress on key factors including a Member’s key floor votes, key leadership positions, key committee assignments and behind-the-scenes actions on behalf of the industry. The score translates into a letter grade: A, B, C, D or F. NAHB’s advocacy efforts helped push congressional leaders to negotiate a new Softwood Lumber Agreement with Canada. It also stopped the implementation of the 2015 Waters of the U.S. (WOTUS) rule during the Obama Administration and then worked with the Trump Administration to draft the new definition. “BUILD-PAC is the breath that allows us to be the voice of the housing industry,” said Ruder. In addition to monetary donations, the HBA has received generous contributions of labor and/or materials from: Kennyâ&#x20AC;&#x2122;s Tile, Henges Insulation, Shamrock Cabinet, and Trendstone. Contributions to the remodeling project are still welcome. The funds the HBA saves on this large project will free up money to be used for Workforce Development and other vital functions of the association. 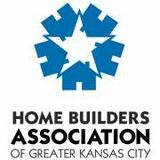 HBA Welcomes William Ruder The Home Builders Association of Greater Kansas City is pleased to announce the selection of William Ruder as its new executive vice president. Ruder’s first day at the HBA was March 11. Ruder comes to the HBA from U.S. Senator Jerry Moran’s office (R-Kan.) in Washington, D.C., where he served as legislative director. As Senator Moran’s most senior policy adviser, he was responsible for formulating and executing the legislative positions and strategy for the office on all issues considered by the United States Senate on behalf of the citizens of Kansas. Builders FirstSource carries a wide selection of high quality building materials suited for both homeowner and professional builders’ needs. We take pride in personal service, and our talented and experienced team provides support to meet the needs of your specific project. Builders FirstSource provides quality materials that will perform well and look great. Make us your first source for lumber, trusses, construction services, millwork, doors, windows, cabinets, and more. Ernst Brothers Home Construction entry. The playhouse made by Bonner Springs High School. HBA Raises $25,000 for Veterans Community Project The HBA is proud to have partnered with the Veterans Community Project (VCP) for its annual Home & Lifestyle Show, which was held March 22-24 at Bartle Hall. VCP is on a mission to eliminate Veteran homelessness by providing transitional-housing and enabling access to exceptional 360-degree service solutions. “We thought this was going to be a hobby,” said VCP co-founder Brandonn Mixon on stage during the show. “We didn’t know it was going to become a full-time job. But the community really stepped up and said ‘we’ve got your guys’ back.’” The HBA is pleased to share that it raised $25,000 for VCP during the Home and Lifestyle Show. During the show, HBA members and Bonner Springs High School built playhouses and hosted a Parade of Playhouses. The playhouses were featured in Bartle Hall during the show and attendees could purchase the playhouses via an online auction throughout the weekend. Additionally, $1 from every Home and Lifestyle Show ticket sold online was donated to VCP. The HBA has a history of supporting local organizations. In 2018, HBA members donated more than $100,000 to Kansas City charities including Harvesters, Ronald McDonald House, Builders Development Corporation and Rebuilding Together. Thank you to Masonite for sponsoring the Parade of Playhouses. We’d also like to thank Owen Lumber, McCray Lumber and Christensen Lumber for delivering the playhouses to the winning bidders. Sending Out An SOS: Harvesters Needs Help! The Spring Parade is partnering with Harvesters again this year. Harvesters provides important food services all year round, but right now is especially critical. Flood victims need their services, as well as children getting ready for summer break. Many local charities, including Veterans Community Project, also use Harvesters. Donations are necessary to keep this wonderful local organization up and running! Visit KCParadeofHomes.com to donate. Builders: The deadline to display a Hammer Out Hunger logo has passed, but your generosity is always appreciated. What Can the Parade App Do For You? The Missouri South Area Council will be held at Unity Village (1901 NW Blue Parkway, Unity Village, MO 64065) on April 24 from 11:30 a.m.-1:00 p.m. The Parade of Homes mobile app creator, Chris Schlemmer, will walk us through the benefits of the app to builders and realtors. Contact Paige@kchba.org to RSVP. BUILDING STRATEGIC digital and traditional marketing campaigns that exceed expectations. NEED ASSISTANCE marketing your business, engaging your target audiences and getting more buyers? WE CAN HELP. construction & development lenders in the Kansas City area. Visit nasb.com/construction to connect with a Loan Officer. ©2019 Nebraska Furniture Mart, Inc.
Bill Koehn of the Overland Park Police Department and Sidney Kile of S.K. Security were the presenters at the Feb. 27 Kansas Area Council at Hallbrook Country Club. Both Koehn and Kile shared useful information and ways to prevent theft on jobsites: •	According to Koehn, having high quality cameras is critical. If a video or picture is unclear and fuzzy to you, it will also be useless to the police. When you team up with Fidelity Bank, buyers enjoy locked terms and rates with a single closing. Builders manage the construction alongside a dedicated, experienced new construction lender. and security of your home is to you and your family. We also understand that your heating and air conditioning systems can be a huge part of your family's health and safety during extreme temperatures. So when you choose us for any heating and cooling services, we will do whatever it takes to make sure you are receiving the highest quality workmanship and the most professional customer service possible. Members Earn 9 Hours of CE Credit Attendees to the HBA’s recent Certified Sales Professional classes earned nine hours of continuing education credit. For three days, this professional-level course, taught by Shawn McGuire who is an NAHB-certified instructor, helped specialists in new home sales gain a broad understanding of the home-building business, discuss consumer psychology and learn the advanced techniques used by real estate veterans for greeting, closing and overcoming objections. Thank you to Cornerstone Companies for letting us use their conference room for the class. NATURAL GAS BRINGS YOU SAVINGS FOR YOUR FUTURE. Homeowners save with natural gas. Natural gas furnaces heat homes more efficiently than electric heat pumps: the average household can save $400 to $500 a year with a natural gas furnace. ^The Single Family number is units and includes both attached and detached units. %Multi-Family units are in buildings with 5 or more units. # Not available at time of report Permit information reflects the most recent data at time of publication. In order to ensure accurate recording of residential building permit statistics, the HBA may revise monthly and yearto-date figures when updated data is made available. Copyright 2019 Home Builders Association of Greater Kansas City. All rights reserved. Learn about the KCHBA's new EVP Will Ruder and check out highlights from the Home Show in this issue.